Five strangers drawn together at a roadside bar on the outskirts of Las Vegas. One rampaging monster, escaped from a secret facility, absorbing victims and accumulating biomass as it moves north from Arizona. The miles between them rapidly dwindling. No, this is not the world’s best math problem, it’s Exponential. The rollicking, brutal, gory, and strangely poignant horror novel from Adam Cesare. Criminals and screw-ups need to face down science run amok in this literary tribute to films like Tremors and The Blob. Yeah, I know it sounds crazy but this is one creepy book that snatches elements from the Blob and the Thing, two movies that horrified me as kid (and still kind of do to this day), and creates a wholly new terror that will send chill down your spine. My favorite part is that it is nothing more than a meager white lab rat that causes such mayhem, death, and destruction. That'll leanr them scientists to go 'round 'sperimentin' on animals! Actually, it is human studpidity and sympathy that unleashes hell on the earth, and no matter what that is the scariest thing in the world. This story plays out just like an homage to 80's horror flicks, and man does it make it work. I mean no disrespect when I say this, but it isn't a deep philosophical story that will make you think for months after the fact. This is, however, one hell of a fun popcorn flick in book form that will entertain you from the start to the finish. It is pretty gruesome too, as people and animals are eaten from the inside out by a gelatinous blob of goo that just wants to nibble on whatever tasty morsel it finds. The fact that the process is intently painful and oddly quiet reminded me of John Carpenter's the Thing. You get it inside you, and it certainly looks painful as it assimilates the men at the outpost, but they never screamed. Same here. It clearly hurts, but you can't do anything but writhe in pain. Godfrey is rock solid in his narration, and provides a great play by play as the monster devours its victims. He adds to the fun, and brings you right into the story. I don't know if the book would have worked as well as it did if they had someone with a deeper or more menacing voice do the reading. He fit this tale like a glove. I enjoyed every minute of it. This is an easy run through, just being a little over 6 hours long, and is more fun than I would care to admit, although I am a guy who grew up on watching B-movies at the drive through, sneaking monster movies on HBO when everyone was in bed, and reading Fangoria and Famous monsters of Filmland. This is my kind of book from start to finish. The writing is fantastic, and you get to know the characters so that you can empathize and sympathize that they died in brutal and unforgiving ways. Don't miss out on a good thing!!! Even though I did receive a promo code for this review it in no way influenced my considerations of the material, and in fact, inspired me to be more honest. Getting a code generally makes me harsher as a reviewer as I am more often concerned what someone like Me will decide based on my review. Adam Cesare, in my mind, has taken a seat at the front of a bus full of horror writers. This group of novelists are not inspired as much by the gothic tales of Poe-Shelley-Stoker-Lovecraft (although there are elements present) as they are by the gory cinema of the 80s (give or take). It's a new age of horror, and it is magnificent. In Exponential, we get some good old fashioned monster-movie scare art. It is mixed media brilliance within the walls of fiction: the slow flame stoking of literary characterization combined with the lit fuse build of suspense all swallowed up by sing-along-familiar, yet creatively original horror tropes. Cesare creates character after character we begin to love, just so we can sit, mouth agape, and watch them being devoured by the creature of our creature feature. And what a creature it is--one we can almost come to love in its own right (almost root for at times ... important times). But what begins as almost a road novel, with a desert traveling monster on the heels of numerous characters, ends up as an epic showdown in a roadside bar between the blob and a ragtag cast of final characters (hop heads, an ex cop, and sort of a modern day female gunslinger of sorts with punk rock hair). There are obvious notes of The Thing and The Blob bouncing around, but what struck me most were echoes of Cujo, with the characterization oozing out gradually between the cracks of our fingers, hiding our eyes from the impending doom. Anyone up for some first-rate monster horror, this book is EXACTLY what you are looking for. The narration is pitch perfect, as well. Matt Godfrey has a knack for switching voices subtly enough to be both noticed and not noticed at the same time. And handled multiple difficultly described emotions with apparent ease. It was a great listen. I have a feeling that if a name like J. A. Konrath/Jack Kilborn or Steve Alten was attached to this story it would receive some significant attention. This story has flashes of their writing styles, with some real depth being added to pretty much every character. Also, as with the authors mentioned above, don’t get too attached to any characters. Let’s just say there isn’t a happily ever after ending to this book. I was impressed with this story overall and am hoping it receives the attention it deserves. 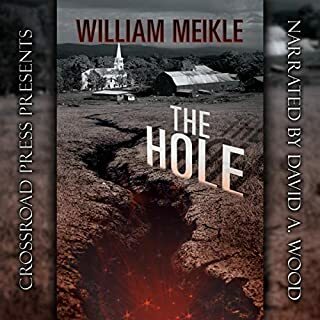 For reasons that may become obvious if you listen to or read this story, I kind of feel about it like I do the movie Tremors, with Kevin Bacon. It is a cult classic that I will pretty much watch any time it is on tv, because I really like it, but it doesn’t quite make it into my top 25 movies list. This story is really good, and I really like it, but it is more of a 4 1/2 Star rather than a 5. The narration is excellent. Matt Godfrey really “tells the story.” His character voice range seems a bit limited but he really kept my interest attention with his ability to drive the story and shape the scenes with his performance. Full disclosure: I was given a free copy of this audio book to review it. And honestly, I wish I'd paid for it. My first exposure to Adam Cesare was his loving homage to early 80's cannibal films, Tribesman (which I just found out has an audio-book and I need to pick up) and I was super excited to get my hands on this. I wasn't disappointed. This was a really fun, really gross little shock story. If I HAVE to be critical, and I suppose since I gotta be honest so I have to be critical, it wasn't particularly *scary*, but what elicits fear from anyone is entirely subjective. I didn't find myself creeped out really, but I was entertained and engaged and wanted to keep reading/listening. This is horror, but it's not the kind of dread-filled slow burn horror that I personally find more scary- this is FUN horror, gross horror, monster movie horror- if this was a movie playing at some 42nd street theater thirty five years ago, it would fit right in (although I doubt anyone short of the true splatter masters could get the squishy slimy monstrosity to look right 35 years ago). The desert setting and the drawing together of the disparate characters together by chance reminded me a lot of Stephen King's Desperation, but where King's novel was kinda metaphysical and meditative on the nature of God, Cesare's story is about gross monster jello rolling around the wastelands getting bigger and more dangerous like a katamari from hell. Have I called it fun yet? It was fun. It's a lot of friggin' fun. It is an absolute recommendation for fans of creature feature horror. Grab it. I like scifi horror, but usually lean more towards ghosts, hauntings and other supernatural things, so a monster horror story was in the ballpark, but still a bit left field. I wasn't disappointed though, and that's primarily because Adam Cesare is a great writer. He's mastered the art of giving characters backstory and depth without droning on or overloading the reader, which means we actually give a hoot about them. There was lots of character growth/development, the dialog was great and the story was loaded with action. The monster itself even got some love! 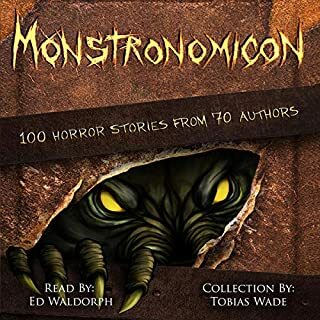 Speaking of the monster, not having read much in this section of the genre, I couldn't tell you how unique it was overall, but I thought it was fresh and well-developed. It definitely presented an overwhelming threat and managed to be scary as heck just by its very nature without any sort of grizzly descriptions to prop it up. The ending was satisfying, and Matt Godfrey once again an amazing job on narration. 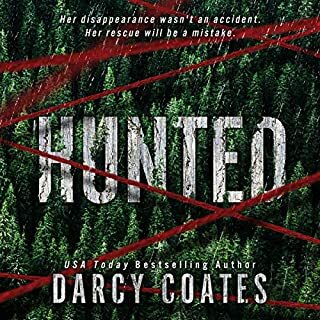 I was provided this audiobook for free in exchange for my review, and I can definitely recommend it for fans of the genre, and perhaps even those that aren't. I laughed at parts I should not have and rooted for the monster when I should not have and had a great time doing it. I love monster stories and this one was another truly fun and wild ride from Adam Cesare. The two books I have read of his creation have been well written, weird, brutal, funny, and perfect nods to the creature-features that I loved to watch as a kid. 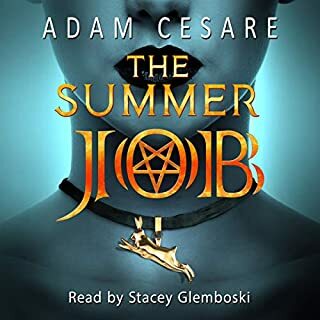 I tend to give a writer two books to convince me that I like their style and candence and Adam Cesare has a new fan in me for sure. 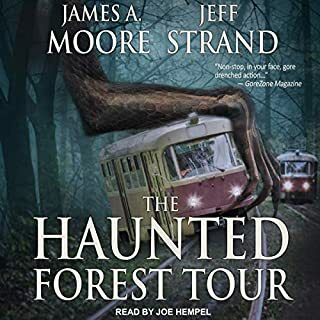 And he gets two of my favorite horror narrators (Matt Godfrey and Joe Hemple) to do a majority of his audiobooks. Matt Godfrey did a fantastic job, as always, with his performance of Exponential. I can't say enough about how much I enjoy listening to him read these books. As with Video Night, he added another rich layer to the already great book. Not a particular long book nor a particular complex premise. 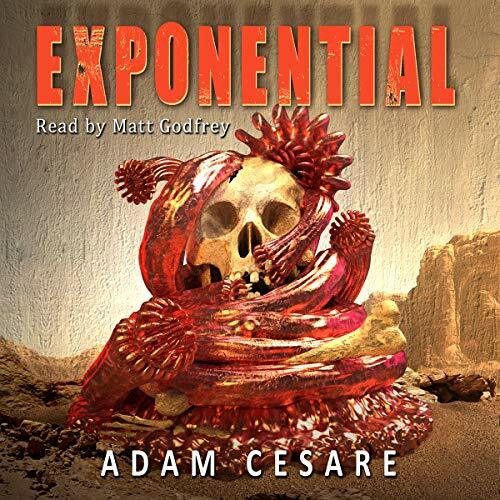 Adam Cesare's Exponential is a great example of a B-movie old school creature feature. While no real backstory is given about the creature other than it's from an experimental lab, that doesn't matter. In a story like this it's all about the creature attacking and the struggle for our 'heroes' to survive. Cool cast of characters and some really fun action. If you like movies like The Blob or The Thing, this story is for you. Could totally see this being made into a movie. Matt Godfrey does a great job with the narration. This is the first book I've heard performed by him, but I'll definitely listen to more of his work in the future. 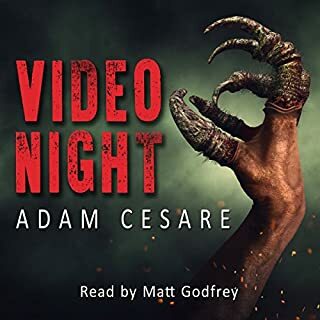 Adam cesare is the best horror writer I have read. I loved this book so much. It is absolutely perfect and his voice, as always, shines through!